"It's a wonderful, easy, light cheese filled cake... but not a cheesecake!" Preheat oven to 350 degrees F (175 degrees C). Lightly grease one 9x13 inch pan. Make yellow cake mix according to package directions. Pour batter into the greased 9x13 inch pan. 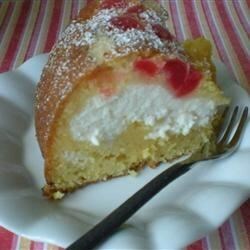 Mix together the ricotta cheese, sugar, eggs and vanilla extract and spoon over cake batter. Bake at 350 degrees F (175 degrees C) for about 45 minutes. Sprinkle cake with confectioners' sugar when cool. Not very flavorfull,no one in my family of 5 much cared for it. Absolutely delicious made with chocolate cake mix. I made one the day before yesterday and it was such a hit that I made another one to take to a potluck last night. It got rave reviews!